The Chelsea Piers Youth Soccer League provides the ideal setting for teams and individuals to compete during the indoor season. The league offers two divisions: Recreational and Competitive. The score is kept for all games, but standings are maintained only for the Competitive Division. For questions, please contact Ron Restrepo at 212.336.6500 ext. 6554 or Rrestrepo@chelseapiers.com. To register, please contact our registration office (212.336.6520) or sign up online. Teams and individuals are invited to register for our recreational division in all age groups. Individuals will be placed on one of our house teams. Regular games played on Saturday. Age groups are determined by each player's birthyear. Travel players are not permitted to play in the recreational division. Game times may change based on the number of teams registered. Players are required to wear jerseys provided by the Field House. Proper soccer attire is required. All teams will play 10 games. Some dates your team will not be scheduled due to a bye. Full season schedule will be released on Wednesday, December 5. The Competitive Division is for teams only. Regular games in the competitive division are played on Sundays. Teams may also have one game per season on a Thursday or Friday afternoon. All playoff games will be played on March 10, 2019 if qualified. GAME AND FORFEIT TIME: A team must have four (4) roster players physically present at game time or a forfeit will be called. THE START OF GAME TIME IS FORFEIT TIME. Forfeits = +10 goals for the victor, -25 goals for the team forfeiting. *If a team has two game forfeits, it will be dropped from the league with no refund. ROSTER/ELIGIBILITY: Only players on a team's official roster are allowed to play in games (15 Players max on a team roster). *Three roster changes only will be allowed during the course of a season. Rosters are frozen after the third game of the season. Any and all roster adjustment post-game 3, must go through the league director from the team's coach. Due to injury or other, the team coach must contact the league director at least 24 hours prior to your next match. No same day, game time adjustments will be permitted. No Roster movement is allowed after week 6. Violation of the roster regulations will equal an automatic forfeit. YOUR TEAM WEB PAGE ROSTER IS YOUR OFFICIAL ROSTER. *NO ROAMING FROM SQUAD TO SQUAD. A Roster Player can [only] play on one team in each division. Each player must sign their team roster prior to by the 3rd match. Teams using illegal or non-roster players are subject to forfeiture of that match. Roster Claims must be made at the time of the alleged transgression or discovery - but shall not wait until after the match has ended as a means of reversing the outcome. Goal Keepers may be on more then one team in a division as long as they have signed that team’s roster. If a squad would like to use a keeper not on their roster, but is a Field House League keeper, they must get the appoval of the opposing captain and league staff [prior] to the match. UNIFORMS: EACH PLAYER MUST WEAR MATCHING GAME SHIRTS WITH A NUMBER ON THE BACK. If any player those not have a matching uniform jersey a 2 minute penalty will be applied were the team play down a man for the full 2 minutes during the match. 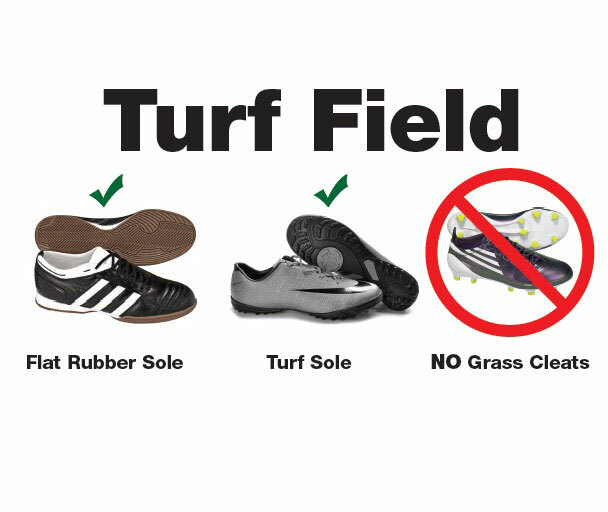 Indoor Turf Shoes & Indoor Shoes are Permitted. NO CLEATS ARE PERMITTED. All Players Must Wear Shin Guards after week 1 of each season. Players playing without Shin Guards will receive a yellow card. (15) Team Shirts will be provided at your first match. Teams may wear their own team shirt with logo providing they all match and have numbers on the back. PENALTIES: The player who receives a penalty must report to the score keeper. Penalty time begins when the ball goes back into play. SLIDE TACKLES: Slide tackles are illegal for all players including the goalkeepers. YELLOW CARDS: A two-minute time penalty shall be assessed at the officials discretion against a player or COACH guilty of offenses as well as un-sportsmanlike conduct, or any other behavior which is disruptive and interferes with the flow of the game. The team receiving the yellow card will play short the FULL TWO MINUTES. * Players entering a dispute who are not involved in a play, or, who enter the pitch from the bench during a caution or difficulty - will be assessed an automatic Yellow Card. A player receiving two yellow cards in one game is automatically suspended for the remainder of the game and must leave the bench area. RED CARDS: A player guilty of violent or abusive behavior towards other players or the Referee will be given a red card and ejected from the game as well as the team’s next game. A red card results in a five minute penalty for that player’s team regardless of any goals scored. Play shall be resumed with a free direct kick awarded to the opposing team. Depending on the nature of the ejection, the Field House reserves the right to suspend the person for a longer period of time, with no fee refund. Two game ejections in one season and that player will be dropped from the league with no fee refund. NUMBER OF PLAYERS: Ages 10 and under will play with six players (including the goalkeeper). Ages 11 and up will play with five players on the field (including the goalkeeper). START OF PLAY: The game or half will be started by a player taking a DIRECT kick into the opposing team’s court. Every player shall be in his/her own half of the court and not less than 3 YARDS from the ball until it is kicked off. During a kickoff the kicker shall not play the ball a second time until it has been touched or played by another player. THE BALL IN/OUT OF PLAY: The ball is out of play when it hits the net surrounding the field, the ceiling, or leaves the field through the door areas. Play resumes with an indirect kick taken from the spot of the penalty. There is NO OFFSIDES. BETWEEN THE TWO WHITE ROPES. IF A GOAL KICK IS TAKEN IT MAY NOT BE KICKED BEYOND THE MIDFIELD LINE. A CORNER IS A DIRECT KICK. Players must give 3 yards on all sides from the point where the ball is going to be kicked. If more than 5 seconds are taken to kick the ball, the referee shall award the opposing team a direct kick. BALL SIZE: Size 4 balls will be used for ages 12 and under. GOALKEEPING: The goalie has 5 seconds to release the ball. Hand To Hand: A goalkeeper, having had control of the ball in his hands, may not release the ball and pick it up until it is played by another player outside the goalie box. Passback: on any occasion when a player deliberately kicks the ball to his own goalkeeper, THE GOALKEEPER IS NOT PERMITTED TO PLAY IT WITH HIS HANDS (This rule is for the Competitive League only & it does not apply to the U8 Competitive Division). A GOALKEEPER IN POSSESSION OF THE BALL MAY NOT THROW IT OVER THE MIDFIELD LINE. Consistent with the U.S. Soccer mandates on heading the ball, heading is banned for all division players under the age of 11 in both practices and games. Heading for players older than 11 is limited to a maximum of thirty (30) minutes per week with no more than 15-20 headers, per player. There is no restriction on heading in matches. An indirect free kick will be awarded to the opposing team if a player age 11 or younger, deliberately touches the ball with his/her head during a game. The indirect free kick is to be taken from the place where the player touched the ball with his/her head. An indirect free kick awarded to the attacking team inside the opposing team’s goal area, must be taken on the goal area line parallel to the goal line at the point nearest to where the player touched the ball with his/her head. SUBSTITUTIONS: The number of “flying” substitutions made during a match is unlimited, except in the case of a goalkeeper, who can only be replaced when the ball is not in play. A player who has been replaced may return to the court as a substitute for another player. COACHES: Only two coaches are allowed at the player’s bench. It is also the coaches responsibility to keep parents back from the fields/gated areas. SPECTATORS: NO SPECTATORS ARE ALLOWED BETWEEN THE FIELDS. ONLY PLAYERS, COACHES, AND CHELSEA PIERS STAFF ARE ALLOWED BETWEEN THE FIELDS. Chelsea Piers reserves the right to institute new rules or to change existing rules for the betterment of the league.